that your LakeCountyEye has been and is the numero uno wingman for 6th District Congressman, Peter Roskam. Well, it's been a sham -- your LakeCountyEye has been living a cruel cruel lie. 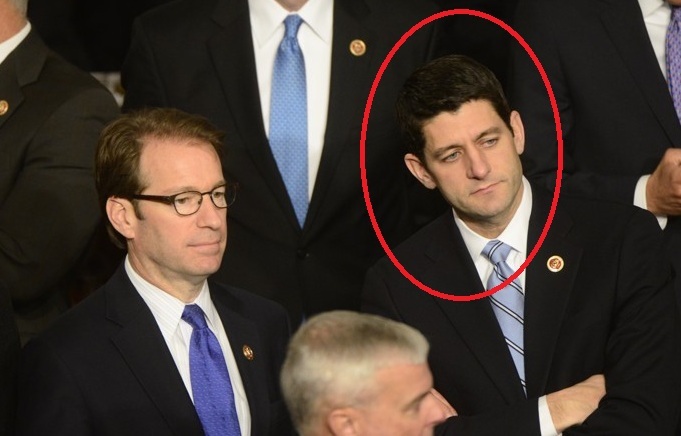 Those wondering what Paul Ryan thought of President Obama's State of the Union would do well to ask the lawmaker who has been serving as the Wisconsin Republican's wingman throught the presidential address — Rep. Peter Roskam (R-Ill.). Roskam, like Ryan, is a young rising star within House GOP ranks. He was seated next to Ryan at the House GOP leadership table on the right-hand side of the chamber, and the former GOP vice-presidential nominee turned to him more than a dozen times through the State of the Union to comment on the president's remarks. Your LakeCountyEye does not know what is more coldhearted -- to learn the truth from an Internet blog or on Valentine's Day. And just who is this Paul Ryan person? Your LakeCountyEye learned that he ran for Vice President once and lost -- like the loser he is. Your LakeCountyEye has also been told that Paul Ryan is some extremist Libertarian who wants to do what all extremist Libertarians want to do -- get rid of Medicare and Social Security, kill funding for education, schools and women's health programs, and legalize marijuana. An open letter from your LakeCountyEye, sent direct, from the heart to Peter Roskam: you promised to be the 6th Congressional District ladies man. You're better than that whatsisname.